Are octaves en vogue at the moment? 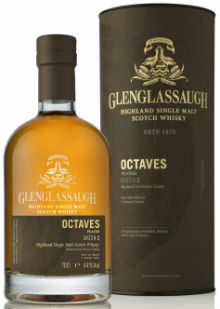 Duncan Taylor have added new expressions to their Octave Collection, AD Rattray have started their Octave Project, and now Glenglassaugh have released the second batch of their Octave range. Unfamiliar with octaves? They’re essentially tiny little 65-ish litre casks, which allow for rapid maturation due to the increased surface area of oak compared to the relatively small volume of whisky. 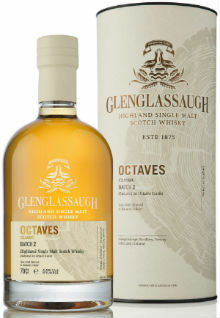 Glenglassaugh Octaves Classic consists of whisky matured in bourbon, pedro ximénez and amontillado octaves, whereas Glenglassaugh Octaves Peated consists of peated whisky matured in bourbon, port and oloroso octaves. Nose: Very bright, with lemon rind, pink wafers, candyfloss, peaches in syrup, mango and lychee. Sawdust too, and a little salted nut mix. Palate: Clean and citrusy – grapefruit, kiwi and lime. Then red currant and cherry undertones with charred oak, cinnamon swirls and spiced pears. Finish: Lingering woodspices, dark chocolate and liquorice. Nose: Beach bonfire, charred steak, leather, toasted raisins and singed orange peel. There’s a coastal element too with BBQ’d prawns and oyster shells. Palate: Smoked lemon, BBQ’d seafood, embers, rolling woodsmoke, rich toffee, manuka honey, cask stave and a cracked black pepper spice. Finish: The woodsmoke dominates, with espresso and dried fruit. Overall: Two very enjoyable, and very different, whiskies. 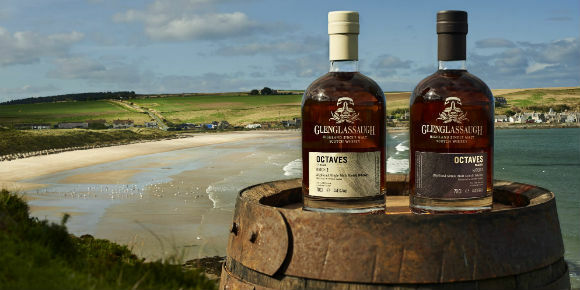 The wood hasn’t dominated in either case, allowing the coastal notes to shine alongside the rich fruit and spice notes derived from the octaves. Both whiskies are nicely balanced and rather well integrated despite their undoubtedly young age. They may be quite straight forward whiskies, but there’s certainly enough there to make you want to pour another dram to investigate further. Good stuff. This entry was posted	on Thursday, November 8th, 2018 at 9:59 am	and is filed under Reviews. You can follow any responses to this entry through the RSS 2.0 feed. You can leave a response, or trackback from your own site. the way I understood the Octaves it is so that you take a 250 ltr. hogshead split it in three 80 ltr. Octaves and after a while you have three single casks of intense sherry maturation or whatever Octave was involved and have tripled the value of the original hogshead. At least tripled. That way Octaves are the replicator technology of the 21st century ?